We wish that we could tap into the Speed Force. It would be immensely useful to never be late for another meeting again. Oh, and say goodbye to standing in airport lines to travel. When you can tap into the Speed Force, you can circle the planet multiple times in mere seconds. Of course, you might have to use your powers to save the universe every once and a while, but we think that’s a pretty fair price to pay for having the coolest super powers in the world! The real question is this. What would you wear if you had those kinds of powers? Obviously a cape is out of the question, since you definitely don’t want it dragging around in the wind when you reach max speed and even though it works for Superman, a pair of underwear on the outside can be pretty tacky. No, you need something that’s form-fitting and conveys a sense of velocity with a single glance. You need this adult deluxe Flash costume. 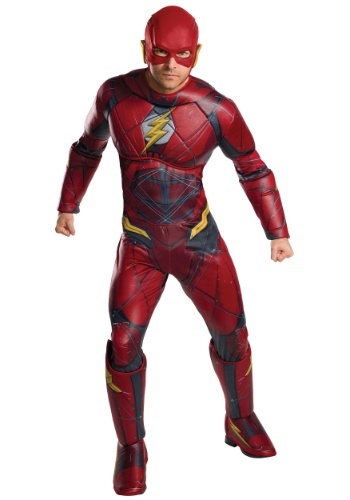 This Flash costume for men is based on the DC superhero’s appearance from the Justice League film. It comes with plenty of details that are designed right into the suit, like faux muscles and faux armor pieces. It also comes with a cowl to wear over your face, since you don’t want your enemies finding out your secret identity! Each piece has lightning bolt accents to give it that authentic speedster look as well. All you need to do is figure out a way to tap into the Speed Force and you’ll be all set to battle the forces of evil alongside Batman and Wonder Woman.